Flies without the use of fins! Very easy to build, and quick-change engine hook makes it easy to fly over and over! 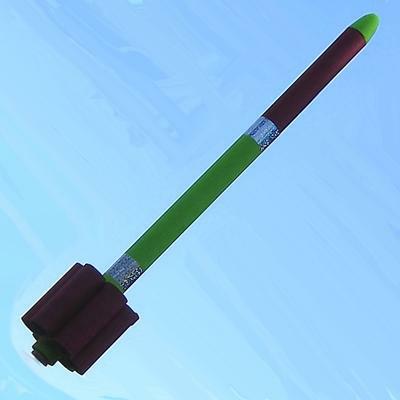 Features our usual top-quality components, outstanding instructions, and balsa wood nose cone. Tube "fins" and payload section come pre-colored red (or change the color if you want!). Large payload section makes running simple experiments a breeze. Great for schools, scout groups, club building sessions, etc. Discounted bulk packing available. For the discounted quantities of 6 or more the kits are provided in bulk form with a single set of instructions (which may be photocopied if desired for each modeler). Required: Adhesive (Wood Glue, such as Elmer‘s Carpenters Glue or Titebond, may be used for all the construction. You may also use Epoxy or Cyanoacrylate [“CA”] glue if you prefer and are familiar with their use); hobby knife with a sharp #11 blade; ruler. Recommended, but not required: sanding sealer (or balsa fillercoat); thinner (appropriate type for the sanding sealer); paint brush; paint (Spray paint, such as Krylon, Pactra or Testors is recommended. Be sure not to mix different types or brands of paint without testing.) - primer (optional), colors as desired & clear (optional); sandpaper (medium - 220 or 280, fine - 320 or 400, & [optionally] extra fine - 500 or 600); tack cloth; filler material such as Elmer’s Fill & Finish, Elmer’s Professional Carpenter’s Wood Filler or interior spackling paste may be used if needed to fill any "dents" or "dings" in the wood nose cone. Electronic launch system; launch pad with 1/8" launch rod; recovery wadding; engines (see list of recommended engines above). You can see the instruction sheets by clicking here.